Climb of Tharpu-chuli also known as Tent Peak at 5,663 meters a thrilling adventure In the heart of Annapurna range of mountains with Great Adventure Treks and Expeditions leading you to a scenic trekking trails passing through the warm country of Hindus and to the mid and high hills in the serene forests of rhododendrons, pines and oaks with constant views of Annapurna to Manaslu range of mountains including the beautiful towering peak Mt.Macchhapuchere ( Fish Tail) then entering the sanctuary enclosed with surrounding high peaks of Annapurna I, A South, Huinchuli, Glacier dome, Gangapurna, Tent peak Mt. Machapuchhere views from the moraines above from Annapurna Base camp. Once in the Sanctuary with amphitheater of snow peaks Annapurna 8,091m) Other major peaks overlooking the Sanctuary include the Annapurna south 7, 219m, Gangapurna 7,455m and Annapurna III 7,555m This area is also referred to as the Annapurna Base Camp and Machhapuchare (Fish-tail) Base Camp. 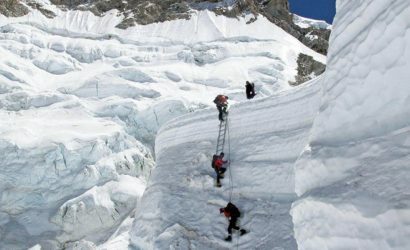 The approach to the ascent route with expert guides of Great Adventure follows a shelf above the west bank of the west Annapurna Glacier, skirting around the base of the mountain’s rocky North East Ridge to reach the base of the peak. The best distant view of this peak can be seen from Annapurna South base. This trek passes through a more diverse range of climate, vegetation and cultures than most small countries can boast in their entire, from lush vegetation of rain and temperate forests to the terraced rice fields. The land and its people change daily, offering trekkers a wonderful introduction to Nepal’s cultural and natural heritage. After an exhilarating climb to the top of Tent / Tharpu chuli peak, return journey descending through the lush terraced Modi Khola valley and finally concluding the adventure at Pokhara, a popular destination with its famed Phewa Lake, dominated by the towering mountain range of Annapurna, Dhaulagiri, Manaslu range including the majestic peak Machapuchhere (Fish-Tail) at 6.990 meters, then finally reaching Kathmandu after a wonderful time in the mountains with Great Adventure Treks & Adventure. 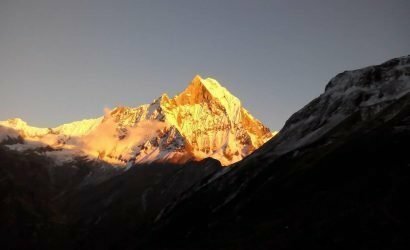 Located in the heart of the Annapurna Sanctuary, Tent peak is an attractive mountain, part of its ridge line joined to the south with Glacier Dome. 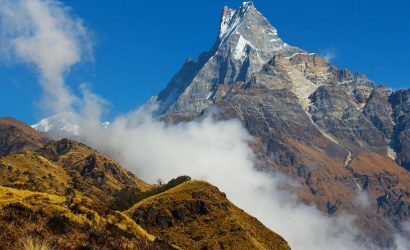 Tent peak or Tharpu Chuli first received attention in 1956 by Jimmy Roberts when he was exploring the area during a reconnaissance for the 1957 British Machhapuchare Expedition. It was then gave it a descriptive name Tent Peak. Situated in the Annapurna Himalayan range at the Gandaki Zone it’s location at 28 36 18 Latitude & 83 57 00 Longitude. Climbing route takes at the right-hand end, the angle and the snow conditions will dictate the best route. From the right – hand end an easy snow slope leads to the foot of a gully. Cross an easy bergschrund and climb the gully between flutings for 60 meters at an angle of 45 degrees, taking the left fork, where the angle steeps to 55 degrees for the final 90 meters to the ridge. At this point the ridge is broad and easy but soon steeps as you climb towards the summit into a knife-edged ridge of approximately 50 degrees. This is followed for 45 meters, after which the angle eases and the ridge leads quickly to the summit. Fixed rope is required on the steep section of the flutings. Day 01: Arrive at Kathmandu 1,300m. via respective airlines. Day 03: Fly to Pokhara and begin trek to Pothana. 1,900m. Day 04: Trek to New Bridge 1,500m. via Landrung. 6 hrs. Day 06: Trek to Dovan approx. 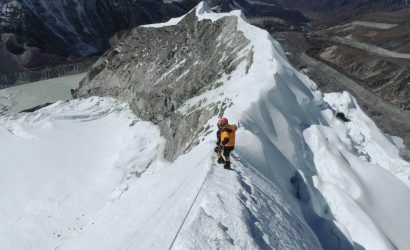 2,400m. via Bamboo 2,260m. 5 / 6 hours. Day 08: Trek to Annapurna Base Camp. 4,095m. 3 - 4 hrs walk. Day 09: At Annapurna Base Camp. Day 10: Trek to Tent Peak Base Camp. 4,115m. 4 - 5 hrs. Day 11: Trek & climb to High Camp of Tent Peak. 4,877m. Day 12: Climbing day and return to Base Camp. Day 13: Spare day in case of bad weather. Day 14: Trek to Machhapuchare Base Camp. Day 15: Trek to Bamboo 5 - 6 hrs. Day 16: Trek to Chomrong. 4 - 5 hrs. Day 17: Trek to Ghandrung. Approx. 1,850 metres. 5 hrs walk. Day 18: Trek to Nayapul and drive back to Pokhara. As per the flight schedule for Pokhara, GA staffs transfer you to the domestic airport for a short half hour scenic flight to Pokhara. On reaching Pokhara trekking staff will receive you for a short drive on the outskirt of Pokhara to begin this adventure, on reaching at Kande, where most of the trekking to Annapurna region begins, then coming at Australian Camp or Thulo Kharka overlooking great impressive view of the Annapurna and Manaslu mountain range including the majestic peak of Mt.Machhapuchare (Fish Tail), after a short break here or a possible lunch break. Journey continues walking on the ridge with constant view of the beautiful surrounding scenery; the path is gradual for 40 minutes through the forest to the village of Pothana for the overnight camp. From Pothana, journey continues leading through the woods with occasional view of the snow capped peaks, the walk is on the level path with few short uphill till a small pass of Bhichok Deuarli is reached at 2,113m / 6,932ft. After Deuarli the trail descends through the rain forest, on the winding level ground till Tolka village is reached, from Tolka walk leads on the winding path with few up's and down's all the way to Landrung village, after Landrung descending through terraces and then through scrubby woodland and boulders where ahead you can see the deep gorge of the Modi Khola. From here an hour slow uphill climb brings us to the overnight camp at Nayapul by the suspension bridge, from where this place got its name after the new bridge over the Modi River, with 2-3 lodges with good camping places. After Nayapul (New Bridge) the path leads to climb steeply up the west bank through the bamboo woodland, high above the river, entering a side valley after an hour of good steady walk reaching Jinu Danda, after nice break here the path continues to a steep climb and then on good stone stairs to a crest which leads to Tulu, where the two path to Sanctuary converge. From here route leads north towards Chomrong village. Chomrong will be the last village before the walk to the Sanctuary. Day 06: Trek to Dovan 2,400m. 5 - 6 hours walk. From Chomrong the trail leads to the terraced farm fields as you descent to the river, after the bridge it's an uphill most of the way for nearly an hour through terraced fields and then through bamboo, contouring the northern flank of the Chomrong Khola. It's worthwhile looking back, not only to the setting of Chomrong but also to see the height gained, the route leads past a small teahouse and then steeply up more steps past mani-stones, continuing more gently it leads to a tea shop at a place called Sinwa at 2,306m. A rough descent leads through rhododendron and boulders and on the crest of the ridge, and soon reaching to Khuldi Ghar, after Khuldi the trail leads to a steep down hill, the path continues through dense bamboo forest and then coming to the appropriately named Bamboo Lodge at about 2,260m. In snow or wet condition the trail through this forest of bamboo can be difficult and slippery. After a short break here, the trail leads through the gorge on this quite narrow valley, after an hour of good walk Dovan is reached for the overnight camp. The trek leads to the rim of the sanctuary, walk continues on the narrow path climbing steeply through the forest and then up steps past boulders below a cliff. Crossing a stream the route climbs to a huge, smoke blackened, overhanging boulder, and known as Hinko Cave, walk leads past crossing two large avalanches cones, the second of which is the most active. The trail climbs again, soon reaching Deorali for possible lunch stop. Soon after lunch Bhagar is reached just beyond Deurali, and at Bhagar there is a potentially dangerous avalanche chute that frequently wipes out the trail. Walk continues climbing steadily along a lateral moraine, crossing two more avalanche cones, following through between the moraine and the valley wall (what geomorphologies call a mulde) and reaching shortly at Machhapuchare base camp for the overnight stop, after a long interesting good walk. Machhapuchare base camp has about 4-5 Lodges located on the near level ground beneath the mighty North Face of Machhapuchare peak, from here the peak looks completely different. Day 08: Trek to Annapurna Base Camp 4,095m. 3 - 4 hrs walks. Today's walk leads in the heart of the Sanctuary at the ABC, the trail follows uphill on the well defined path along the trough on the south side of the moraine bordering the Annapurna South Glacier for few hours, the trek is pleasant as you reach the higher ground with magnificent views of an array of snow peaks all around you with Annapurna I, a great wall of mountain on the north west, after a good scenic walk for few hours finally reaching at Annapurna Base Camp for the overnight halt. Camping is placed near the premises of the lodges around, with superb panorama of the surrounding snow range scenery. Rest day for proper acclimatization with optional short hike around this magnificent surrounding, base camp has several lodges and is situated beneath the north-east flank of Annapurna South peak. Tent Peak base camp is on the opposite side of the glacier, on a flat shelf above the lateral moraine. Day 10: Trek to Tent Peak Base Camp 4,115m. 4 - 5 hrs. Trek through the rubble-covered glacier and climb the moraine cliffs, the path across the glacier is marked by cairns and heads directly towards the moraines on the north side of the glacier. The moraines might look loose and dangerous sometimes, there are several ways in case of very tricky and formidable. The path leads to a flat boulder strewn area below the moraine near a small stream bed, a faint path leads over loose terrain to the crest of the moraine, the flat, grassy area above the moraine at 4,115m is the only possible good camp site to establish as Tent Peak base camp. 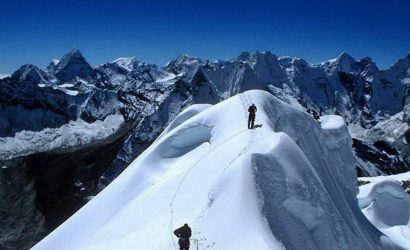 Day 11: Trek & climb to High Camp of Tent Peak 4,877m. To climb this peak, a high camp is necessary. From the Base Camp route follows the moraine north-west for about ten minutes to an obvious deep-cut gully. a grassy buttress, then it crosses the stream above the gully and contours the hillside to reach the flat summit of buttress at 4,420m. A ridge above this place is followed to a level area which may be snow covered at 4,877m. This will be our suitable High Camp for the climb. From the high camp, the level glacier below the west flank of Tharpu Chuli can be reached without difficulty in about an hour with the support of GA expert guides, following easy slopes towards the Raksi Peak and the left-hand side of the glacier, avoiding all possible crevasses.This leads to the level glacier at 5,334 meters, from here crossing easily to the foot of the fluted wall separating Tharpu Chuli and Singu Chuli. The wall is approx.120 meters high at its lowest point, rising to 180 meters on either side. From the summit superb panorama of all the Annapurna range of mountains can be viewed from Hiunchuli 6,441m, Annapurna South 7,219m, Annapurna Fang 7,647m, Annapurna I 8,091m, Gangapurna 7,455m, Annapurna III 7,555m, Annapurna V 7,525m, Mt.Machhapuchare 6,993m including Singu Chuli or Fluted Peak 6,501m. 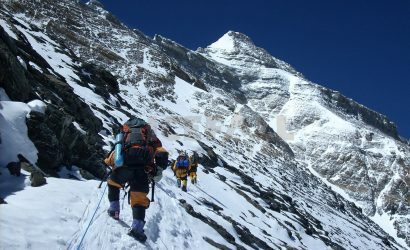 After a great memorable feat descend by the same route towards the Base Camp. Retrace the journey back to MBC via Annapurna Base Camp. Day 15: Trek to Bamboo. Retrace the journey by the same route. Day 17: Trek to Ghandrung or Ghandruk 1,750m. 5 - 6 hrs walks. Day 18: Trek and drive to Pokhara. 3 - 4 hrs walks with 2 hours drive. Day 19: Transfer to Airport for the flight back to Kathmandu. Day 21: Transfer to Airport for International departure.